Bad wi-fi got you down? You’ve got a host of hardware options that can help you out, from mesh routers to Wi-Fi repeaters, but before you upgrade any set up, do some detective work—with some carefully chosen apps you can work out where your wi-fi network is failing and come up with better possible solutions. First of all, check the download and upload speeds you’re getting and compare them with the figures promised to you by your Internet Service Provider. An app like Ookla Speedtest (Android, iOS) or Netflix’s Fast Speed Test (Android, iOS) can do the job here—the Netflix app is the simplest, but is specifically related to speeds to and from Netflix servers. The Ookla one, besides more broadly testing your internet speeds, gives you a few neat extras, like cellular coverage maps. Straight away you can do some basic troubleshooting by running separate speed tests in the different rooms of your house and taking an average. It’s a good idea to run at least three tests in each spot, just to make sure you’re getting an accurate average. 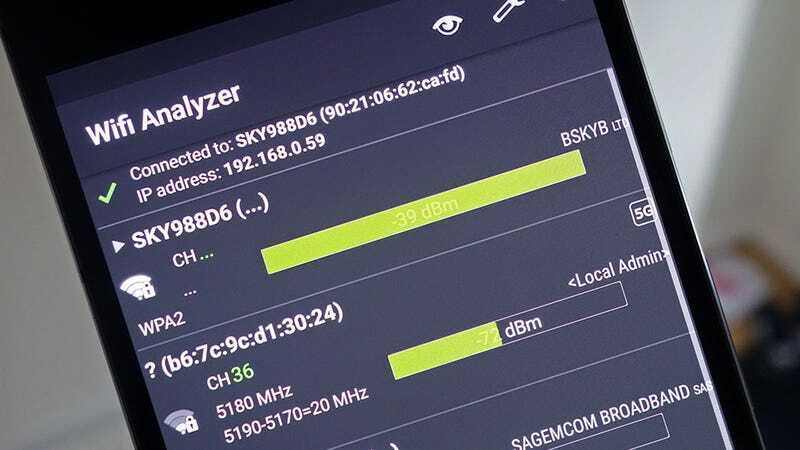 For a more detailed look at exactly what’s happening with your Wi-Fi and where, you can take advantage of a whole host of analyzer apps for both Android and iOS. They’ll give you detailed readings of Wi-Fi strength and channel congestion: The different wireless channels being used by local devices, and how busy each one is. Wi-Fi Analyzer (Android) is a popular and long-standing option for phones powered by Google’s mobile OS. First, tap the eye icon and choose Signal meter, then hit Tap here to select... and choose your home Wi-Fi network. What you’re seeing here is a strength reading in dBm or decibel-milliwatts—these work in negatives, so a lower negative number means a stronger signal. For streaming video at any kind of quality, -67 dBm is recommended, though for less data-intensive tasks such as emailing, -70 dBm is fine. -30 dBm is a perfect connection. It’s really when the Wi-Fi Analyzer meter starts to drop into the left-hand edge of the yellow section or the gray section that you need to worry about the signal being too weak. One way you can try and fix this is to switch to a different Wi-Fi channel on your router, but first delve into the app settings (the wrench icon to the top right). Make sure the available channels on both the 2.4GHz and 5Ghz options are set to match the channels in your part of the world. If you’ve never come across the concept of channels before, they’re essentially frequencies at which wireless signals are broadcast by your router. Modern-day routers and hardware can usually operate on the same channel without any problems, and will often automatically cross several channels to provide for faster speeds, but in some circumstances switching channels can make a difference, especially if you live in close proximity to your neighbors (and their Wi-Fi). The newer 5Ghz frequency offers more channels than the older 2.4GHz standard, if your router supports it, so there’s less chance of interference. It doesn’t have the range of 2.4GHz though, so devices further away from the router might suffer. The options available to you will depend on the router you’ve got installed at home. So, walk around your home using the Wi-Fi Analyzer meter to test signal strength, and in the worst spots, switch to the Channel graph or the Channel rating from the drop-down menu below the eye icon. This shows you which of the available channels (network frequencies) are best to connect to, indicated by fewer curves (the graph) or more stars (the rating screen). Actually switching channels is done through your router’s settings page—check the router documentation if you’re unsure, but this typically involves typing its IP address into your web browser and logging in. Some routers will handle channel switching automatically for you, and moving to a less congested one can improve the signal strength you get. Even if you don’t change channels, you can use the scanning tools in Wi-Fi Analyzer or a similar app to reposition your router or the device you’re trying to connect (maybe your laptop would be better on the other side of the study). It takes a lot of the guesswork out of how your Wi-Fi is performing. As we’ve mentioned, plenty of other apps will do the same job of scanning wireless networks and channels. IP Tools (Android, iOS) does the same analysis and a whole lot more besides, and comes highly recommended by the pros, while Wi-Fi Heatmap (Android) and Wi-Fi Analyzer and Surveyor (Android) actually let you mark your Wi-Fi signal strength on a map of your home once you’ve sketched out a floor plan. The same screens are available and are easy to navigate—in Wi-Fi Analyzer and Surveyor, for example, tap Channel to see how crowded the available wireless channels are on both the 2.4GHz and 5GHz frequencies. Tap Signal, meanwhile, to see the signal strength of your own router and any other nearby access points. To start mapping signal strength out, tap the menu button (top left) then Surveyor. Besides shifting around your router and other devices, and switching router channels, you’ve got a few other options when it comes to improving signal strength in the furthest corners of your house, and again the readings you get from your smartphone apps will come in handy when you’re positioning equipment. Buying a Wi-Fi booster or repeater is one option, and they’re pretty cheap online. They effectively just pass on your existing Wi-Fi signal to more of your home, though the amount of extra oomph they can give the signal varies—they’re a better option for connecting a laptop than a 4K Chromecast. Faster speeds and more reliable connections can be obtained by investing in powerline networking kit, which connects via a cable to your router then uses your home’s electrical wiring to send the signal around your mains sockets. You’ll pay a bit more for these devices but the extra performance is worth it for gear like games consoles. Finally, there are a growing number of mesh networking solutions on the market, like packages from Google and Eero. By splitting Wi-Fi duties between multiple devices rather than one central router, you get a stronger signal all around the home, but just be sure they’re going to work with your ISP’s service before you upgrade.